It takes just two visits to clean, condition and apply a specialist protective seal to a leather sofa to restore it to its former glory! 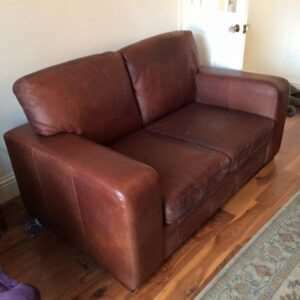 To ensure your leather furniture ages gracefully, wipe the leather with a clean, dry cloth regularly. Cleaning the leather removes dust and debris and keeps it looking it’s best, you should also consider vacuuming as it can reach crumbs and other debris hidden in tiny crevices. Keep the leather from drying out and developing cracks by conditioning it regularly. Also, if you can, try to keep the furniture out of direct sunlight as this can also damage the leather.